Google have released a report that details the company’s economic impact in all 50 U.S. states. But why read a report when you can get the bottom line just by clicking on a state on a Google Map? Across the U.S. Google's search and advertising tools generated $54 billion of economic activity in 2009. 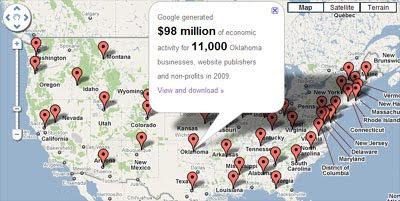 Google's Economic Impact Google Map shows how the search giant has helped hundreds of businesses in every U.S. state. If you click on a state on Google's Map you can view the total amount of economic activity and how many state businesses, website publishers and non-profits benefited. Each information window also includes a link to download that state's report.